This Post has already been read 1602 times. 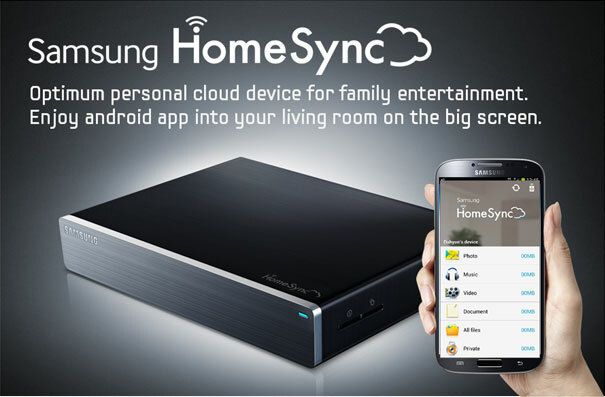 Samsung Electronics Co., Ltd has announced it will extend compatibility of HomeSync to more Android devices. Through the Google Play app store, more Android devices – including non-Samsung devices – will be able to enjoy the benefits of HomeSync. HomeSync is a home hub solution that provides enough storage space to protect the whole family’s digital content, delivers an immersive big screen TV entertainment experience, and brings users a whole new way of enjoying HDTV through a familiar and smarter Android user experience. HomeSync provides one terabyte of private cloud storage, which is enough room to upload 10 photos daily for 82 years, or five minutes of home video for 10 years. The device supports up to eight users with five devices each, so that the whole family can save and share images, music, videos, documents and files from any registered device. Easily enjoy content in HomeSync through a variety of multimedia devices by mirroring content from your device on your TV in full HD using an HDMI cable, or connecting to your music player through an optical audio port. With HomeSync’s Android Media Center, enjoy the best of Android gaming, videos, and music, or flip through photos on your home television for a full HD viewing experience. You can also use your mobile device as a remote mouse, with easy control of compatible devices. Enjoy the full Android experience with access to Android-based services from Samsung like Samsung Apps, Media Hub and Video Hub, as well as Google services like Google Play and YouTube.